The Ede have long lived in the Tay Nguyen or high plateau region of central Vietnam. Traces of their origin are reflected in their epic poems, their architecture, and their popular arts. Up to today, the Ede community remains a society imprinted with matrilineal traditions. Other names: Anak, Ea De, Ra De (or Rha De), E De, Egar, De. Population: 194,710 people. (1999 census). Language: The Ede language belongs to the Malayo-Polynesian group (Austro-nesian language family). 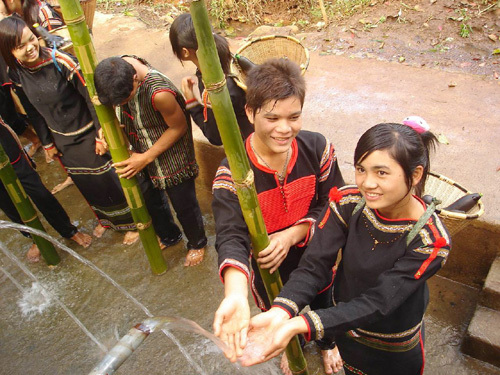 History: The Ede have long lived in the Tay Nguyen or high plateau region of central Vietnam. Traces of their origin are reflected in their epic poems, their architecture, and their popular arts. Up to today, the Ede community remains a society imprinted with matrilineal traditions. Production activities: The Ede’s principal food crop is rice, cultivated on swidden fields which, after a certain period of time, are left fallow before being exploited anew (cleared and burned). Each period of exploitation of a field varies between 5 and 8 years, based on the quality of the soil. Crop rotation and intercropping is practiced and there is only one rice harvest per year. Wet rice fields are. found only among the Bih near Lac Lake. The most numerous animals and poultry raised on the family farm are pigs, buffaloes and chickens, but they are mostly used when there are ritual sacrifices to perform. The most widespread family handicrafts are the plaiting of household , objects out of bamboo, the cultivation of cotton in order to weave cloth with the aid of looms similar to those found in Indonesia. Pottery and blacksmithing are not well-developed among the Ede. Barter was the most widespread marketing practice in former times. Diet: The Ede eat rice cooked in clay pots or in large-sized metal pots. Ede food includes a spicy salt, game meat, bamboo shoots, vegetables and root crops obtained from hunting and gathering activities. Ruou can, fermented alcohol consumed using a bamboo drinking tube or straw, is stored and served in large earthen jars. Steamed sticky rice is reserved for ritual occasions. Men and women chew betel nut. Clothing: Women wear a long cloth wrapper or sarong which reaches to the toes; their torso may remain unclothed- or they may wear a short pullover vest. Men wear the loin cloth and a vest of the same style. When they are cold, men and women wrap themselves in blankets. Ede jewelry include glass beaded necklaces, rings made of copper or nickel that are worn around the neck; wrists, and ankles. Men are women alike have their teeth filed, blacken their teeth, and prefer distended ear lobes. Head coverings include the turban and the conical hat. Housing: The Ede primarily live in Dac Lac province, the south of Gia Lai province, and the west of Phu Yen and Khanh Hoa provinces. The traditional Ede house is a construction whose length is reminiscent of the shape of a boat which is cut lengthwise or across giving it a shape of a reversed trapezoid. The structure rests on two rows of columns and not on the ground. The interior space is divided into two parts along the length. The first section is called Gah; it is both the reception area and the communal area of the large matrilineal extended family. The other part, ok, is divided into many small rooms, each of which is reserved for a couple in the extended family. Transportation: The plaited carrying basket with two shoulder straps remains the principal way for the Ede to carry their goods. In the Krong Buk region, the footed basket is the most widely used. The elephant is also a mode of transport, but not all that popular nowadays. Social organization: The Ede family is matrilineal: marriage is matrilocal, the children carry the name of the mother’s family, and the youngest daughter is the inheritor. Ede society is regulated by customary laws based on the matriarchal system. The community is divided into two lineages in order to facilitate marriage exchanges. The village is called buon and constitutes the a unique kind of habitat. The inhabitants of a buon can belong to many branches of the two lineages, but there is also a nuclear branch. The head of the village is the po pin ea or the master of the place of water. He directs, in the name of his wife, the affairs of the community. Marriage: It is the woman who takes the initiative in matrimonial relations. She chooses the intermediary in order to ask for a young man in marriage, and once the couple marries, they live with the wife’s family. If one of the couple dies, the family of the deceased’s lineage must replace the spouse according to the chue nue (continuing the line) custom so that the surviving spouse is not alone. It also ensures that the thread of love tied between the two lineages, Nie and M/o, do not rupture-in conformity to the teachings of the ancestors. Funerals: The chue nue must be observed for each death. In the case of the death of old age or sickness, the funerals are organized at the home before the burial at the cemetery. In the past, if the people of one lineage died on dates near to those of the death of the same lineage, the deceased would be buried in the same grave. Consider that the other world is a reincarnation of the present world, the Ede share the deceased’s goods and dispose of them in the funerary structure. From the time that the funerary house is made, the celebration of the abandonment of the tomb takes place to put an end to the cares to the soul of the deceased and to his tomb. New house: The construction of a new house is of interest to the entire village. Villagers help bringing material (wood, bamboo, straw) or help with manual labor in a system of exchanging labor (called H’rim Zit). The inauguration of the new house will take place when one has finished planting a row of trees along the wall. However, one can move well in advance of this date if the conditions are not organized for the inauguration. Women, led by a khoa sang – the female head of the matrilineal family are the first ones authorized to walk on the new floor. They carry with them water and a fire in order to give coolness and heat to the new house. It is an Ede way to wish happiness on the members of the new house. Calendar: The traditional agricultural calendar is fixed to the evolution of the moon. The 12-month year is divided into 9 periods corresponding to the 9 steps of agricultural work: clearing the fields, burning the vegetation, turning over the soil, weeding… Each month is comprised of 30 days. Education: Apprenticeship to a trade or craft and the dissemination of knowledge is done by demonstration, by imitation, and oral transmission. Ede writing based on Latin script made its appearance in 1923. Artistic activities: The khan is a long epic poem that one recounts in vivid exclamations and illustrates with gestures. There are alternating songs, riddles, genealogical histories… Ede music is celebrated by the ensemble of 6 flat gongs, 3 gongs with projections, a gong for rhythm, and a drum. The gongs would never be absent from a festival or cultural activity. Aside from the gongs, there are bamboo instruments and calabashes resembling those of other ethnic groups in the Tay Nguyen region, though they are distinctively Ede. Entertainment: Children like spinning top, kite flying, and flute playing. Stilt-walking is enjoyed by many. Hide and seek and lance or javelin throwing at a target are also currently enjoyed.